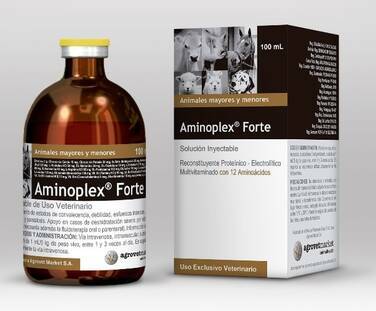 It is aminoacids concentration is 33 times higher than Aminoplex® Light. Treatment of severe conditions of convalescense, of weakened animals, or under intense strain, stress, shock, chronic diseases, parasitosis, preparation for competition, high production and as support therapy in severe dehydration cases due to vomits or diarrhea (in this case, oral or parenteral fluidotherapy is also necessary). Dextrose 50 mg, Calcium chloride 0.15 mg, Potassium chloride 0.2 mg, Magnesium sulfate 0.2 mg, Sodium acetate trihydrate 2.5 mg, L-Histidine hydrochloride 0.34 mg, DL-Methionine 0.34 mg, DL-Tryptophan 0.34 mg, L-Cysteine hydrochloride 0.34 mg, L-Threonine 0.68 mg, DL-Isoleucine 0.68 mg, L-Arginine hydrochloride 0.85 mg, DL-Phenylalanine 1.02 mg, DL-Valine 1.7 mg, L-Lysine hydrochloride 1.02 mg, L-Leucine 1.36 mg, Monosodium glutamate 1.36 mg, Vit. B1 (Thiamine hydrochloride) 0.10 mg, Vit. B2 (Riboflavin-5-phosphate) 0.04 mg, Vit. B6 (Pyridoxine hydrochloride) 0.1 mg, Vit. B12 (Cyanocobalamin) 0.05 mcg, Nicotinamide 1.5 mg, excipients q.s. ad 1 mL. Used in the treatment of severe conditions of convalescence of weak animals or animals submitted to intense stress, shock, dehydration, chronic diseases, parasitosis, and as support therapy in cases of severe dehydration due to vomiting or diarrhea. 1 mL/5 kg of body weight, administered between 1 and 3 times a day, according to the severity of the case and the judgment of the physician. Apply through intravenous, intramuscular, subcutaneous or intraperitoneal route. In horses, only the intravenous route is recommended. Glass vial of 500 mL.